In January, publisher Namco Bandai said that a petition to have cult hit Dark Souls ported to the PC had its "attention". Now, an Australian PC magazine is teasing something a little more substantial. The newest PC Powerplay mag has hit newsstands, and its back page, teasing next month's issue (pictured above), isn't very subtle. 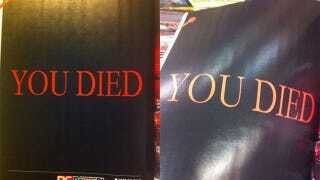 It's got splashed all over it the game's trademark YOU DIED prompt, in the right font and everything. Given the fact the magazine only hit stands this week, and that Namco are engaged in one of those awful LIKE US FOR NEWS scams over on its Facebook page, the likelihood of this being confirmed later this week actually seems pretty damn high. Still, it's all 100% unconfirmed at this point, so don't get too excited, OK?